Free templates for osCmax users. Very simple drop-in templates which make no changes to core files. Second iteration (Version 1.1) of a carbon-fibre look theme originally by osCommerce member "Greyerash". Now with more consistent buttons. Some elements of the original are missing at this point due to the template being designed as a drop-in addition, with no changes to any other files. Very simple to install. Some have now been incorporated into the main public release of this excellent ecommerce package. Normally, it is advisable to check the osCMax forum for discussions about a particular contribution, as no (free) assistance is given here. In many cases a file here is based on previous work by contributors to both osCMax and osCommerce. Their credits/comments are normally left intact in the files, where appropriate. As is the case with all Open Source software, by downloading/installing the supplied files you are taking full responsibility for their intended use. No warranties apply. 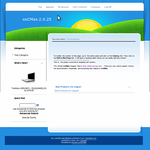 osCMax 2.0.25 is the previous stable public release of the package. standard installation of osCommerce. In addition, there have been a few feature enhancements, not least of which, to image handling capabilities. quite some time to come. As an osCMax Team Member and frequent forum 'helper', ejSolutions (aka Ridexbuilder) is able to provide a quality service for the installation and support of osCMax. Though web design is not a core competence, ejSolutions can provide customised templates to give your site a unique look. My clients benefit from custom coding, often released to the osCMax community where appropriate. osCmax 2.5 - the new era. Substantial upgrades and alterations have been done with this version, at version 2.5.3 at time of writing. Clients are already realising the benefits from the 2.5 series release and its' rich feature set makes for a pretty complete webstore application. Image handling is further enhanced along with substantial additions/features to both front-end (store) and back-end (Admin.). For people who wish to stay with the more stable release (and traditional osCommerce 2.2 look), an unofficial osCmax 2.0.35 can made available. Click here for further info on osCmax and osCommerce in general.